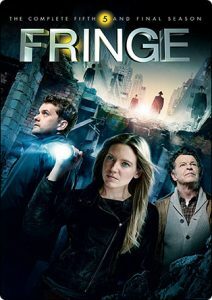 Fringe follows the casework of the Fringe Division, a Joint Federal Task Force supported primarily by the Federal Bureau of Investigation, which includes Agent Olivia Dunham; Dr. Walter Bishop, the archetypal mad scientist; and Peter Bishop, Walter's estranged son and jack-of-all-trades. They are supported by Phillip Broyles (Lance Reddick), the force's director, and Agent Astrid Farnsworth (Jasika Nicole), who assists Walter in laboratory research. The Fringe Division investigates cases relating to fringe science, ranging from transhumanist experiments gone wrong to the prospect of a destructive technological singularity to a possible collision of two parallel universes. The Fringe Division's work often intersects with advanced biotechnology developed by a company called Massive Dynamic, founded by Walter's former partner, Dr. William Bell (Leonard Nimoy), and run by their common friend, Nina Sharp (Blair Brown). The team is also watched silently by a group of bald, pale men who are called "Observers". Season 1 introduces the Fringe Division as they investigate cases that form "the Pattern" geographically centered around Reiden Lake in New York state, many of which are orchestrated by an international network of rogue scientists known as ZFT (Zerstörung durch Fortschritte der Technologie, or in English, Destruction through Advancement of Technology), led by David Robert Jones (Jared Harris), who are preparing for a doomsday event. The ZFT threat appears to end when Peter kills Jones as he attempts travel to a parallel universe. Olivia comes to learn she was a child test subject for Walter years ago (then known as Olive) for a nootropic drug, Cortexiphan, giving her weak psionic abilities. Walter also struggles with adjusting to normal life in Peter's care after living seventeen years in a mental institution while hiding the fact that Peter is from the parallel universe, "his" Peter having died as a child. In Season 2, the occurrences are found to be in conjunction with activities of a parallel universe, which is plagued by singularities occurring at weakened points of the fabric between worlds; over there, scientists have developed an amber-like substance that isolates these singularities as well as any innocent people caught in the area on its release. The Fringe team deals with more cases that are leading to a "great storm" as the parallel universe appears to be at war with the prime one, engineered by human-machine hybrid shapeshifters from the parallel universe. Walter is forced to tell Peter that he is from the parallel universe, a replacement for his own Peter, who died from a genetic disease. Walter had crossed over on the frozen ice of Reiden Lake in 1985 to administer the cure for the alternate version of Peter, but, after accidentally destroying a dose of the cure upon transport, he instead brought the boy across. On return, they fell through the ice but were saved by the Observer September (Michael Cerveris), who told Walter of the importance of "the boy", which Walter took to mean Peter. Walter's crossing is what caused the singularities in the parallel universe, with Reiden Lake at their epicenter. Walter has been looking for a sign of forgiveness in the form of a white tulip. Season 3 presents episodes that alternate between the two universes. "Walternate", Walter's doppelgänger in the parallel universe, is the U.S. Secretary of Defense and has set events in motion to assemble the Machine, a doomsday device that reacts only to Peter's biology. He also sent his Olivia, "Fauxlivia", to the prime universe, in Olivia's place, to engage the Fringe Division and assemble the prime universe's version of the device, while he studies Olivia's Cortexiphan-induced powers. By happenstance, Fauxlivia becomes pregnant with Peter's child, Henry, before being outed and extracted to the parallel universe. Walternate orchestrated acceleration of the pregnancy to gain a sample of the baby's blood, which he uses to activate the machine. Peter, with Olivia's help, enters the prime version of the machine, and experiences a vision of the future where the parallel universe has been destroyed and the same fate threatens the prime one, and learns the Machine is really a device created by Walter and his associates from this future, sent back in time purposely to relay this vision of the future to Peter. Recovering in the present, Peter alters his plan and uses the Machine to merge the two rooms, creating a bridge where inhabitants of both universes can solve their dilemma, before time is re-written so September (The Observer) doesn't save him and is forgotten by both Walter and Olivia. Season 4 begins in an alternate timeline, one in which September had failed to save the alternate version of Peter in 1985, according to the Observers. This creates a butterfly effect influencing the main characters' pasts but otherwise stabilizing both universes due to the creation of the bridge. Peter is pulled into this new timeline due to the actions of the alternate timeline's Fringe team, which includes Lincoln Lee (Seth Gabel). Peter initially works to return to his own timeline, fueled by fears that his memories are altering Cortexiphan-dosed Olivia's of this timeline, but after encountering a wounded September, Peter comes to learn that this timeline is truly his home, and both he and Olivia come to accept the change, rekindling their affair. September also reveals to Peter that the Observers needed to erase Peter's son, Henry, to assure their future will be created, though noting that Peter's future child with Olivia will be important. Meanwhile, in the present, William Bell has instructed David Robert Jones, alive in this timeline, to work with the parallel universe's version of Nina Sharp to synchronize the two universes, aiming to collapse them both and pave the way for a third universe under Bell's control, using Olivia's Cortexiphan powers to enable the collapse. The Fringe division is forced to close the dimensional bridge, but this fails to stop Bell's plan. Walter is left with one choice, to shoot and kill Olivia, her death disrupting the process and saving the world. Olivia's "death" is only temporary, as the Cortexiphan in her body is consumed to repair the bullet wound, leaving her alive and healthy but lacking her psionic abilities. As Olivia and Peter begin their lives together, September appears to Walter and warns that the Observers "are coming". The fifth and final season begins in 2036, following from the flash-forward fourth-season episode "Letters of Transit". As September warned, Observers from the far future, having ruined Earth for themselves, time-traveled to 2015 and instituted "The Purge", wiped out much of humanity, subjected the survivors to their control, and began modifying the planet's environment to be more suitable for themselves. The Fringe team was able to seal themselves in amber to avoid capture shortly after the Purge, and are reunited through Henrietta ("Etta") (Georgina Haig), Peter and Olivia's now adult daughter who disappeared shortly after the Observer arrival in 2015. Walter reveals he and September developed a plan to defeat the Observers, revealed through a series of pre-recorded videotapes ambered in the lab. The tapes lead to several components of a device, including a young Observer child, named Michael (Spencer List in Season 1 and Rowan Longworth in Season 5), but further allude to a man named Donald that had helped Walter prepare the plan. Etta is killed during these events, driving Olivia and Peter to complete the plan for her sake. Through Michael, they discover Donald is September, having been stripped of his Observer powers for helping the Fringe team, and that Michael is his genetic son, having been purposely grown as an anomaly in the far future. September explains the plan is to send Michael to the year 2167, where human genetic experiments to sacrifice emotion for intelligence would be started and leading to the creation of the Observers; by showing them Michael, who possesses both emotion and intelligence, the experiments would be stopped and the Observers never created. September is prepared to take Michael to the future as the plan is set in motion, but he is shot and killed at the last moment; Walter, already made aware that he will have to make a sacrifice, takes Michael through to the future to assure the plan's completion. As predicted, time is reset from the invasion onwards in 2015; the Observers never invade, and Peter, Olivia, and Etta, live their lives peacefully—though Peter receives one final letter from his father: a drawing of a white tulip.